Oh, handbags. Next to underwear, shoes, and swimsuits, it's hard to think of a fashion item with a less attractive cost-per-square-inch. But if you have a few hours, a few beers, some leather and a needle and thread, you too can make a gorgeous, top-quality bag of your own. No sewing machine required. You'll need everything you see here; click this or any photo to enlarge. Clockwise, from left: A cutting mat and ruler; Wood glue or PVA glue; A magnetic purse clasp; A hammer; A measuring tape; A flat chisel; Linen thread, such as that suitable for bookbinding; Sewing scissors; A rotary cutter; An awl; A lump of beeswax; And four strong, long needles, such as those used for bookbinding. Technically, you don't necessarily need the cutting mat, the ruler, or the rotary cutter — you could do all your measuring and cutting out with a tape measure and your sewing scissors. But with leather, I personally find it a lot easier and more precise to use the rotary cutter. Last but in no way least, you'll need some leather. If you live in a city where you can obtain leather at a good fabric or specialty store, you're in luck! I found this most excellent goat skin at a spot in New York's Garment District last Friday. But if you don't, you can also buy leather online from a number of retailers — call and ask questions, to check you're getting what you think you're getting — and there's plenty of leather and bag findings available on eBay. The obvious drawback with buying leather sight unseen is that you can't touch it until it arrives, but I've had wonderful results from eBay leather finds. When I decided to teach myself how to work in leather, I made my first three bags from a giant half cowhide I got on eBay for like $40. If you've never worked with leather before, you should know that it's sold priced per square foot, and, like denim, its heavy-dutiness is measured in weight per square foot — the higher the number of ounces, the thicker the hide. Many leather retailers will only sell whole hides, but you can find partial hides readily on eBay. For this bag, you'll need a small hide or a part of a hide, totalling about 5-6 square feet. And you'll want to use at least 6oz. leather. Leather needn't be expensive — my goat hide was $44.37, a fraction of the cost of a new handbag, let alone a nice leather one, and I have enough left over to make a wallet or a coin purse — but it's worth paying for quality: you want full-grain leather (that's leather that hasn't been cut laterally, or "split," in order to double or triple the area of the hide), not a resurfaced ("corrected-grain") split. Leather is skin; it has a kind of integrity that you don't want to interrupt, if at all possible. Compared with corrected-grain splits or top-grain leather (which is the uppermost part of a split hide), full-grain leather is stronger, develops a nicer patina, and performs better over time. If you don't want to make a leather bag, you can still use this tutorial — just cut the pattern in a different fabric, and sew it up. (I would, however, use a sewing machine.) I would also strongly recommend using a really heavy-duty interfacing if you're going the fabric route, and therefore a lining. Now, I'm going to show you step-by-step how I made this bag. And if you want to make this bag, too, then great! But if you don't, the pattern-drafting and sewing techniques explained here will permit you to make virtually any bag of your choice. Let the scope of your ambitions be your guide. Whatever you want to make, the first step is to sketch how you want your bag to look, and then sketch how the individual pattern pieces will fit together. These first sketches can be rough. They're just a guide. I measured out my pattern properly, and cut it out of a paper bag. Here I laid the paper pattern over a 1"x1" grid so you can take a look; click to supersize. Pieces marked "1" are to be cut once, pieces marked "2" need to be cut out twice. No seam allowances are included. Just to check things were all working as I wanted, I pinned my pattern pieces together. I made this bag 11" wide, so that it could fit a folded New Yorker. I spend a lot of time on the subway, and my current black handbag is just too small to hold a magazine, which is basically the most annoying thing ever. I end up having to fold the New Yorker in half laterally, just above or just below the staple in the middle of the spine, and then by the time I get to the middle of the magazine, there's so much wear on the spine the leaves are falling out, and then about four times a year they send out those monster perfect-bound issues — just try bending that — and I just, I give up. I give up. I'm not going to live in that New Yorker-less underground hell anymore. I am making a choice here. I choose my choice. I choose reading material. Next, spread out your leather and start laying out your pattern pieces. Each piece of leather is unique, and if your hide has any kind of distinctive pattern to it — mine is pebbled, with the pebbling growing heavier over the animal's back and smoother towards the belly and limbs — plan it so that the patterns will more or less match across major seams. If there are any scratches, holes, or superficial defects in your leather hide, obviously arrange your pattern to avoid them. Use a ruler and pen to draw around your pattern pieces on the wrong (suede) side. Add 1/4" seam allowances. This is what all the pieces look like cut out. First, we're going to set the magnetic clasp. Line up the patterns for the bag flap and the main body of the bag with the cut leather pieces for each, and punch through the marked guide lines with the chisel. Poke the "legs" of the magnetic closure through the chisel holes, and through the flat guide included with the clasp. Fold the legs outwards with your fingers, and tap with the hammer to set. If you don't have a work bench to use, do your hammering on an old cutting board. Put the "female" magnetic closure on the envelope flap, and put the "male" closure (pictured here) on the main body of the bag. From a piece of scrap leather, cut a flap that will cover the back of the "male" clasp. Set this aside for now. First, we're going to join the two triangular shapes from the front of the bag to the main body. Using the awl and working on your bench/cutting board, punch holes every 1/8" inch along the seam, remembering that the seam allowance depth is 1/4". We are using an awl to make the holes that we will sew through by hand because — unless we're talking 2oz garment weight leather for a skirt or something — I do not believe in sewing leather on a home machine. Not even with a kevlar foot and leather needles; it's just not what they're designed for, it doesn't give a good result, it can harm the machine, hand-stitching is not that hard, and besides, hand-stitched bags are far more durable. We're going to sew our first seam! First, you'll need to prep your thread. Unspool a piece of linen thread three times as long as the seam you're sewing and cut. Next, if your thread is a different color than your leather, run it under a felt-tipped pen or a marker a few times to dye it to match. Then, run the thread through the beeswax 2-3 times to coat it, and pull the waxed thread under the sole plate of a hot iron to set. Now it's time to thread the needle. About 1" from each end of your thread, poke the point of a needle through the thread (like the photo on the left). Push the needle most of the way through, and then work the 1" tail through the eye (center photo). Pull the needle through the rest of the way (right photo). This is called locking the thread, and it makes sewing leather so much easier. Now you have one long piece of thread with two "locked" needles at either end. Start at one end of your seam, and push one needle through the awl holes in both layers of leather; pull the thread until the two tails are even. You now have one needle on the "top" side of your seam, and another needle on the "bottom" side of your seam. Push the "top" needle down through the next awl holes, then take the "bottom" needle, and push it through that same set of awl holes. Try not to sew through the thread, which will weaken it — you want the two threads to pass by each other in the tunnel of the awl holes. Tug the threads tight, keeping the two tails even. You just sewed your first stitch. Repeat in this fashion until you reach the end of the seam, then work backwards 2-3 stitches, pull the two thread tails to the same side of the seam, and knot. The cut your needles free, and trim the tails from the knot to about 1/4". This will make a very strong, flexible seam. Using a rubber mallet or a hammer — you can wrap the head of your hammer in a piece of scrap leather to protect your work — pound the seam allowance open. Just hit the fucker. Hit it really hard. It'll flatten. The left seam has been pounded open, the right seam hasn't yet. On the main body piece, use the hammer to pound in two folds that signify the bottom of the bag; inside the side seam allowances, cut notches at the edge of each fold. Prepare a thread, lock in your needles, and stitch the darts on the side pieces; pound those seams open, too. Next, we're going to sew together the two pieces that make up the envelope flap. There's the lining — which is where we set the female half of our magnetic clasp — and the exterior. Because these two thick pieces of leather are going to curve over the top of our bag, we need to do something called "grading" to insure that the lining doesn't become visible around the edges of the bag. On the external flap, punch awl holes at just less than 1/4" in from the edge; on the lining flap, punch awl holes at just more than 1/4" from the edge. Prepare two threads, lock in all four of your needles, and begin stitching the flap edge from the center, and work outwards. Stop about 3/8" from the end of the seam. On the curved parts of the flap — the center, and the two curves of the sides — use the scissors to notch the seam allowances. Stagger the notches between the two pieces as shown. I lightened this photograph to for detail. Turn your flap right-side out. Pound the flap seam with your mallet or leather-wrapped hammer to flatten. Now you have a flap, a main body of your bag, and have sewn the darts on your two side pieces. We're well on our way to having a whole bag! Next up, we'll attach the side pieces to the main body of the bag. As we did for the flap, cut and prepare two threads, lock in all four needles, and stitch from the center bottom out and up the sides. At the back of the bag, where the envelope flap will eventually attach to the main body, leave the last inch of the side seam undone. Pound the side seams when you're done. This was where I left things for the night. When I awoke, this is what greeted me. It's like they know what's the most precious and completely inappropriate thing they could possibly use for a pillow, the devious little buggers. 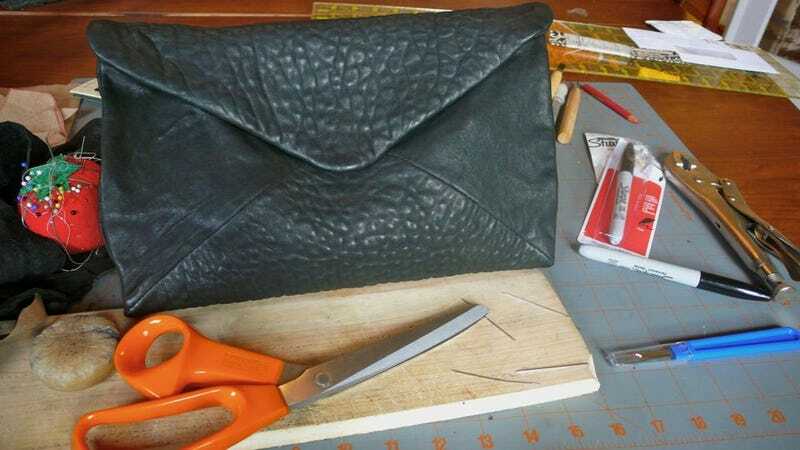 Measure along the top edge of the body of the bag, and cut a strip of leather from a thin piece of hide (like the belly) equal to that length and approximately 3/4" in width to use to bind the raw edge. (Wider if your leather is thicker, obviously). Awl-punch the edges of the binding and awl-punch the raw edge of the bag. Start at one edge and sew on the binding. When you reach the center, attach the little flap you cut to hide the back of the magnetic clasp from sight on the inside. This binding follows a curve, so it will be a little bit wavy when it's first stitched; don't worry about that, because once it's pounded flat the waviness will disappear. Next, cut an interior pocket from a scrap piece of leather. Awl-punch it, and stitch. I did not bother dyeing my white linen thread black for this part, since it is an interior pocket after all. Using the glue, bond the very edge of the interior pocket to the back of the bag. Ta-da: Our sewn and pounded envelope flap, and our sewn and pounded bag. All they need is to be joined together in one last seam. First, grade the raw edges of the envelope flap: make the lining side about 1/8" shorter than the exterior side. Also notch the seam allowances at the edges, to reduce bulk. Now that the top edge of the bag is bound and finished, sew up that last 1" of the back side seams. Sandwich that seam between the two layers of the envelope flap. Awl-punch carefully through all the layers. Make one big punch-hole at each side. Awl-punch the envelope flap, and awl-punch the raw edge of the bag. Again using two threads and four needles, start stitching the final seam from the edges in. When you reach the interior pocket, check that you're stitching through it, too. And when your two threads meet in the middle, pull all four needles inside the bag, behind the interior pocket. That's where you'll tie your knot, to hide it from view. This is the finished product. Basic, but handsome. Oh, and it fits a New Yorker, too. If there's something you'd like to see as a DIY project, just email me me your suggestions (or tell me on Facebook). In the meantime, to check out past DIYs — including how to do a '30s-style moon manicure, how to make a fascinator, how to alter a thrift-store dress, and how to dye in the comfort of your own home — click here.